Level 1: this course provides beginning students a solid foundation in basic written and spoken Italian and the cultural norms necessary for everyday communication in Italy. It is specifically designed to help students obtain functional competency in speaking, reading, writing and listening in Italian. Cultural awareness is enhanced through the use of authentic audio-visual materials and some selected literary texts. Level 2: this course is designed for students who have previous knowledge of Italian and need an in-depth review of the basic patterns of the language. The aim of the course is to further develop listening, reading, writing and speaking skills through communicative in-class activities and at-home assignments. The course will present new grammatical/communicative functions and it will also review patterns already presented in Level 1. Moreover, Level 2 includes the reading of excerpts from contemporary Italian literature that will serve as the basis for in-class discussion. Students will also explore selected aspects of Italian society through a variety of texts and audio-visual materials. Level 3 helps students achieve a very high level of conversation and it is specifically designed to build up refined vocabulary. 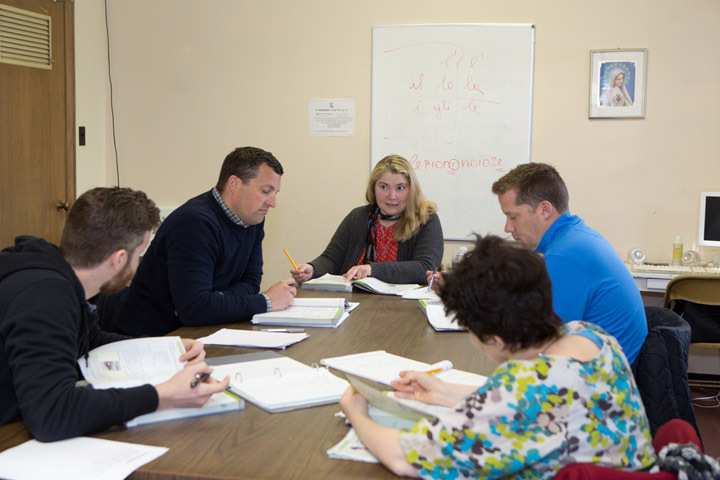 Using a variety of literary and nonliterary texts as models, students examine the linguistic structure and organization of several types of written Italian discourse. This course is also intended to help students attain high levels in reading, writing, and listening through readings and debates on various issues of relevance in contemporary Italian society.